You've got that nagging feeling that the art you're making is "good" but it's not quite "great" yet. I say this because I know first-hand how hard it is to keep going, making and understanding the work, let alone grasping all the layers of personal, conceptual and theoretical threads. As artists we’re great at making the work – that’s what we do. What isn’t so easy is being able to step outside of it to see it for what it is. The Studio Visit is your time to be seen and heard; your time to break out of the stuckness, come out of hiding and put your feet firmly on the path of being the artist that you’re here to be. Something’s missing. It’s that nearly impossible to name essential something, that thing, that once achieved makes your work fully alive, indescribably authentic and unmistakably yours. It’s that same thing that attracts all the right people to your work and generates the reactions you know you deserve. You find yourself wondering... Am I saying what I really need to say? Why do I feel like something’s missing? Can I honestly say that I see my most authentic self in this work? You feel caught in a loop that you can’t get out of – making the same work over and over again. You feel a gap between what you’re currently making and the artist you see yourself becoming. You’re multi-passionate and are tired of people telling you that you have to choose one direction and forget about the rest. You need a boost, a cheerleader, someone standing on the sideline who believes in you and can give you the push you need. You feel that whatever is standing in your way is dark and thwart-y and isn’t going to go out or give in without a fight. We need someone who can be there with us, in our studio, amongst the artwork, seeing our genius and helping us to name the unnameable. I know how much momentum it creates to have that one, right person see our work, see what we’re doing and support us in getting to the next level. Hence, the Studio Visit. How Do These Studio Visits Work? Each Studio Visit is 3 hours long and divided up into three parts. This is where you show me your work and tell me all about it. We’ll take as much time as we need to examine your work, what excites you, where you feel stuck, what’s working and what’s not. I’ll prompt you with lots of questions. Once I have a sense of the threads that are woven into your work and how they seem to be connected to your grandest vision for your creative life, I’ll reflect back what I’m seeing, we’ll discuss and then extract the threads that feel most aligned with your heart. I’ll offer insight based on the whole person in front of me, the work that’s there and the desires you’ve expressed. Now that you’re feeling seen and inspired, we’ll discuss possible next steps, what support you might need and what regular actions steps will help you to get where you’re going. To walk away with a clear sense of where the energy and vitality is in your work. To feel more able and ready to honour your genius. Key insights that will support you in bringing more of what’s missing into future artwork. Practical action steps to move you forward. A sense of inspiration and excitement about what’s next. A Welcome Package that brings boatloads of insight. Recordings and follow-up notes to help you further integrate the material. Register by Friday, Oct 12th and receive a complimentary 90 minute Manifesting Money the Fun and Feminine Way Coaching Call. Jessica will walk you through her special 10 step process to help you creatively, and femininely manifest more money in your life. DO I NEED TO BE FORMALLY TRAINED AS AN ARTIST? Definitely not. The only requirement is that you have a body of work, or fragments of various bodies of work that we can look at. IS THERE A PARTICULAR STAGE OF MY CREATIVE CAREER THAT I MUST BE IN? The Studio Visit is designed for artists who are making work on a regular basis and have a number of pieces to show. In order for me to get the best sense of what is at the heart of your work I’ll need to see a broad enough selection of your work. Don’t worry if you don’t feel that your work is cohesive enough. The intention of the Studio Visit is to find the gold in what you’ve got and help you to move forward from there. WHAT IF I DON’T KNOW WHAT’S NEXT FOR MY WORK? That’s exactly what we’re going to help you to figure out. Not knowing is a beautiful place to start. I suggest bringing a spirit of curiosity, genuine desire and intentionality to our time together. WHAT IF MY STUDIO IS IN MY LIVING ROOM? It doesn’t matter where your studio is, but I do suggest, if your studio is in your home or if you have a studio mate, that you make sure that our time together is private and free of distractions. While I’d love to meet your children, your pets or your studio mate, having them running around during our time together won’t take full advantage of your Visit. HOW WILL OUR TIME TOGETHER BE STRUCTURED? Each session is three hours long and takes place in your studio or over Skype. 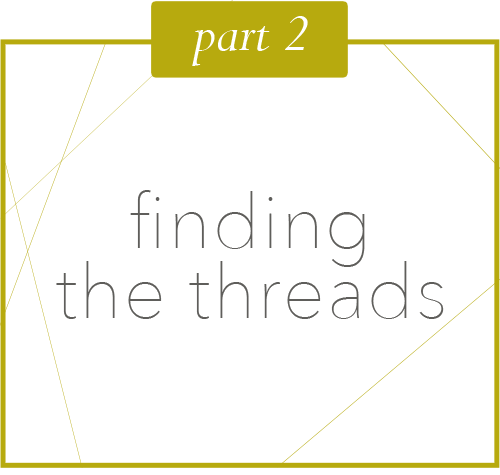 There are three basic segments: Your Work, Following the Threads and Stepping into What’s Next. Somewhere in the middle we’ll stop and take a short break to let things percolate. DO I HAVE TO BE A PAINTER? No. I’m a painter so artwork within the visual art realm is what I’m most equipped to support you with, but you don’t have to be a painter. Sculpture, installation, drawing, photography, social practice projects – it’s all welcome. BUT YOU’RE IN PRAGUE, HOW WILL THIS WORK? I do the Studio Visits when I'm traveling and come to you or we use the magic of Skype! If at the end of our session you feel that you haven’t gotten the clarity you were hoping for, and you took the time to fill out the intake form and were fully present for your Studio Visit, we’ll schedule an additional Skype call to discuss what seems to be missing. Sometimes that residual feeling of something-is-missing is the very key to unlocking what’s next. Take a look at our Terms & Conditions for more details. By the time we’ll meet you’ll have already filled out and sent back your Welcome Package at least 2 days before our session. On the day of our session be prepared and have ready to show any artwork that feels most relevant and that you’d like to discuss. I suggest having a notebook handy. You’ll receive a follow-up summary and a recording of your Studio Visit within a week of our session. Other than that just bring your sincere questions, a sense of curiosity and the intention that something new will break through during our time together. HOW WILL I KNOW IF YOU’RE THE RIGHT FIT FOR ME? Have a good look at my website. Check out my work, read a few blog posts. My approach to art-making is that it is always intimately connected to our most authentic selves and that deep down we all long to live the most creative, genuine lives possible and can make a viable career out of it. In order to get there we have to purge, jettison and get down and dirty with who we really are. If you’re still not sure, we’ll schedule a 30 minute Skype call to answer any questions you might have and to see if we’re the right fit.